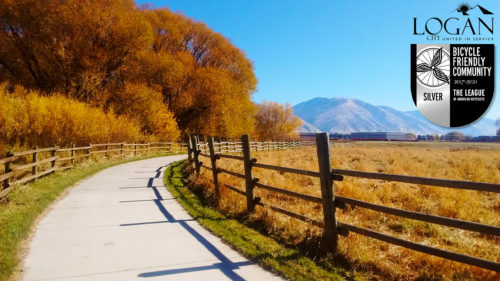 With over 15 miles of trails, 5 miles of bike lanes, and a bike park and bike share system on the way, and much more, Logan is recognized as one of the best towns in Utah for cycling. Today, the League of American Bicyclists recognized Logan with a Silver Bicycle Friendly CommunitySM (BFCSM) award, joining over 400 visionary communities from across the country. With the announcement of 65 new and renewing BFCs today, Logan joins a leading group of communities, in all 50 states, that are transforming our neighborhoods. This national recognition puts Logan alongside Salt Lake City, Moab, Park City and Provo as the top ranked bicycle friendly communities in Utah. Logan, Utah was awarded a silver level Bike Friendly City Award in 2017. Photo courtesy Logan City. The BFC program is revolutionizing the way communities evaluate their quality of life, sustainability and transportation networks, while allowing them to benchmark their progress toward improving the ease of navigating by bicycle. With this impressive round, there are now over 400 BFCs in all 50 states. The Silver BFC award recognizes Logan’s commitment to improving conditions for bicycling through investment in bicycling promotion, education programs, infrastructure and pro-bicycling policies.